The perfect storage solution for those demanding a bit more space, without sacrificing beauty and quality, our San Juan Door Chest will give you all the room you need. Crafted with simplicity and functionality in mind, our San Juan Door Chest is a stunning example the timeless Mission style that utilizes clean lines and bold panels to accentuate the natural beauty of the hardwood. 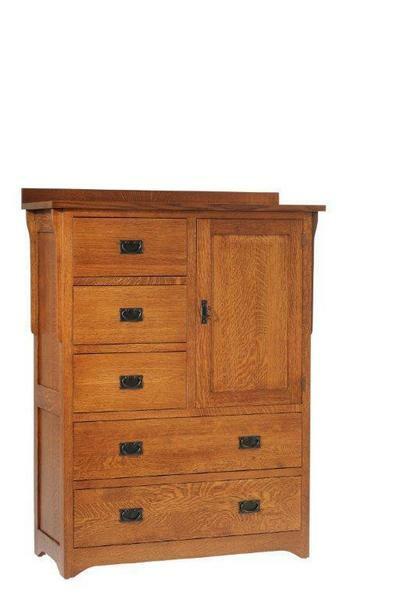 Our San Juan Door Chest combines the functionality of a Chest of Drawers, with the versatility of an Armoire. Offering five full-extension drawers, with smooth gliding side-mounted slides, you'll have the much needed room to house your sweaters, jackets, linens and other less-frequently used items, in a convenient location. Alongside the top row of drawers, the San Juan chest offers a door cabinet that features an adjustable shelf, where you can store your larger items with ease. With some many possibilities for this Chest of Drawers, you can be sure to get the most from your new furniture. Call one of our experienced furniture specialists today to answer your questions or start your order by phone. We offer stain samples for every piece, so you can be sure your new furniture will match with your decor. Toll-Free 866-272-6773 .